Quilters on The Central Coast have been busy working towards their Quilt Show to be held next week. 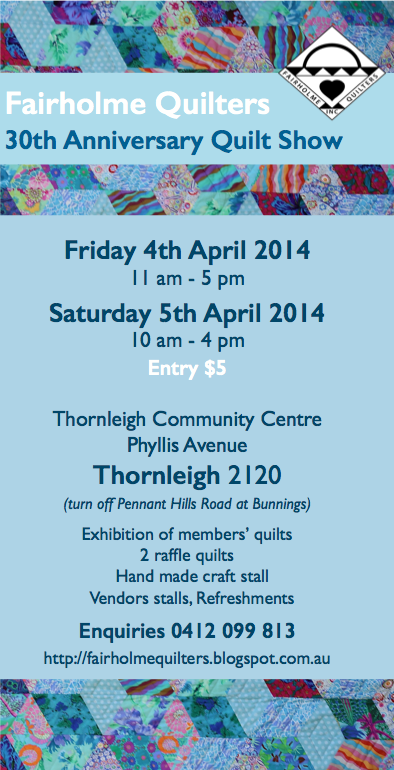 Come and support several local charities , and these hard working quilters. 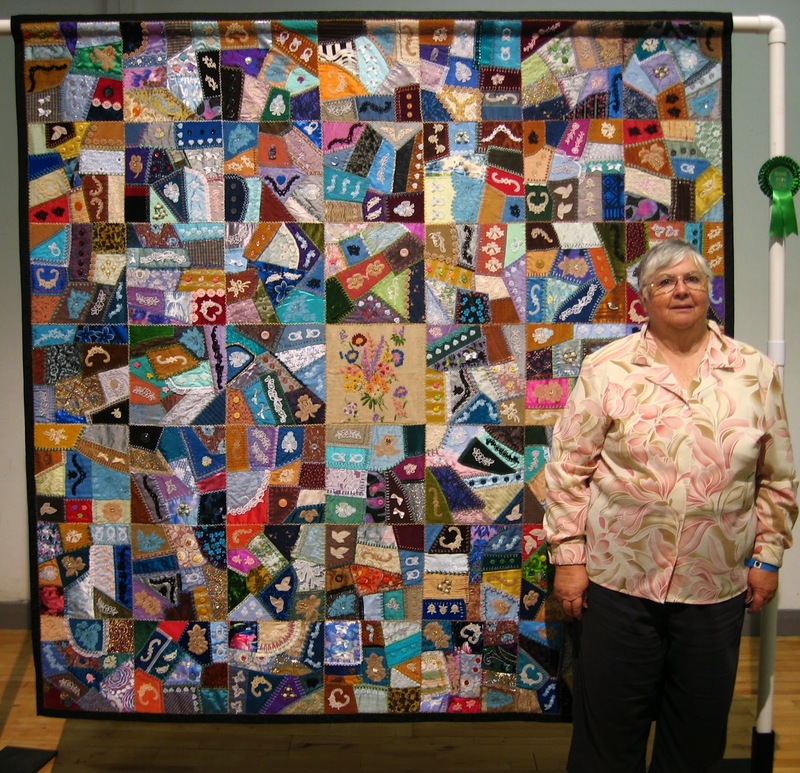 Yvonne Line always has many interesting quilting and personal stories to share, anytime she is asked to speak to Guild Members, and at the next Friday Showcase Yvonne is expected to again entertain with insight, and wisdom alongside numerous colourful quilts. Having sewn "all her life" and quilted since the late 60's it could be said that Yvonne commands a matriarchal role in the quilting world, but if so, it is one where knowledge and skills are always shared, with Education and Charity being two of Yvonne's guiding lights. Please come along and hear the latest in the many quilting accomplishments of Yvonne Line. Fairholme Quilters are becoming very excited about their forthcoming 30th Anniversary Quilt Show, and invite everyone interested to come along. This year there are two Raffle Quilts to be won, and they can be viewed at the exhibition. Venue : Thornleigh Community centre, Phyllis Avenue, Thornleigh. Refreshments available, and vendors stalls to peruse. 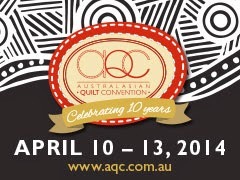 Many quilters will be making final plans to visit Melbourne in April for the 10th Anniversary of AQC. Members of The Quilters' Guild of NSW Inc are invited to help Vic Quilters at the event. Tutor’s Helper is 8.45 – 5.00 with lunch and morning and afternoon tea included – duties include handing around class notes, ironing for those who may require extra help, shopping for class participants, chasing up items for the tutor if required and liaising with the Archangel Marg Dietrich. Both White Glove and Tutor’s Helpers are given complimentary entry – names will be on a list at the main entrance. Photo ID is required and a Guild name badge would be appreciated. Victorian Quilters Inc. office is housed in the far right hand corner of the western annexe where the Quilt Exhibition is hung. Marg Dietrich has her area at the entrance to the Office. All White Glove and Tutor’s Helpers report for duty to Marg at this point. Entry : $5 per person. Please have all paper work regarding your Quilt Entry, Payment, Photo, Volunteer Form and any other further additional information into the office on or before March 14 : THIS FRIDAY. A Quilt Exhibition in Nowra, promoted by Shoalhaven Lioness Club, supported by many local Businesses and Presenting : Carolyn Konig, Maker of Reproduction Quilts. . . . . . . to see the glorious array of quilts being exhibited by members of Avalon Quilters. Volunteers : come and join us! Meg and Cath . . . always smiling and so ever generous in sharing their quilting knowledge. Meg gave many an impromptu lesson on QAYG methods, whilst Cath's forte was hexagons! Pleasurable camaraderie abounded at the Guild's Desk during The Stitches and Craft Show at Rosehill yesterday. There to field questions regarding membership, exhibitions and lessons, as well as talk about the exhibited travelling quilt displays : SAlt, Beautiful Australia, and the Guild's own Challenge portfolio, fellow volunteers made the day a delight to be part of. Thankyou Cath, Meg and Jessie. Please be sure to visit Guild volunteers on the First floor at Rosehill Gardens Racecourse if visiting over the weekend. You are bound to see smiling and helpful members sharing the love of their craft. 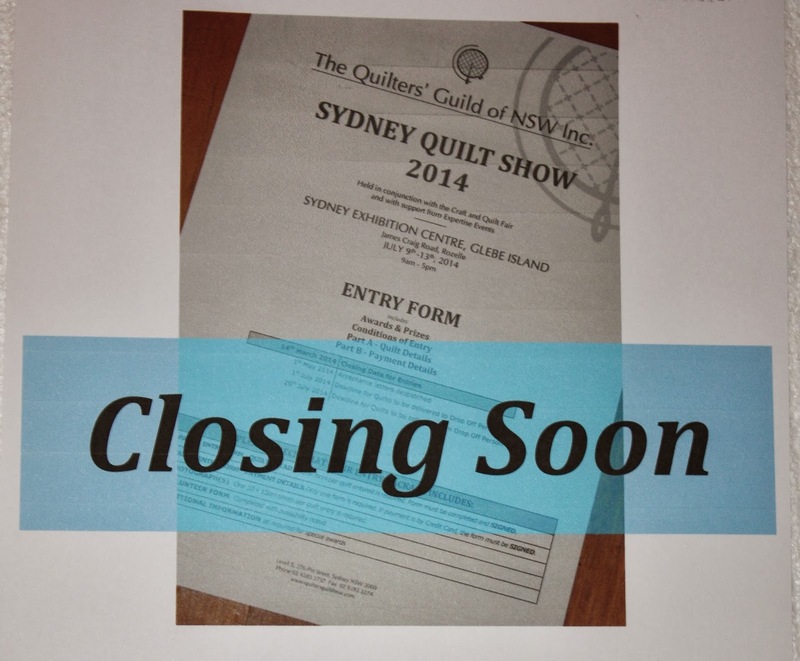 And, if you are tempted, sign up as a Volunteer for the Sydney Quilt Show in July. Happy times are guaranteed! Also seen at Rosehill was Guild member Lisa Walton; Exhibitor at Dyed & Gone to Heaven. Lisa was just one of a number of Members working and promoting the many varied facets of the quilting industry. Say "hi" to them as well, when you visit, they love seeing a familiar face.